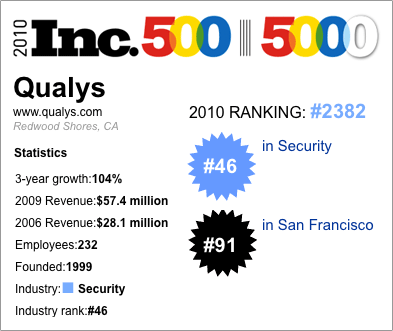 Qualys has again been named to Inc. Magazine’s prestigious Inc. 5000 list , recognizing the fastest-growing private companies in the US. With this accomplishment, Qualys joins the rarified company of enterprises who have appeared on the list multiple consecutive times. The recognized leader in providing on demand IT security risk and compliance solutions for global companies, from SMBs to large enterprises, Qualys has achieved revenue growth of 104 percent over the last three years.